Tom Sullivan is making a name for himself in the world of native pollinators. His design of a pollinator garden at “That’s a Plenty Farm” in Hadley, Massachusetts, has become a showcase as well as an outdoor classroom. 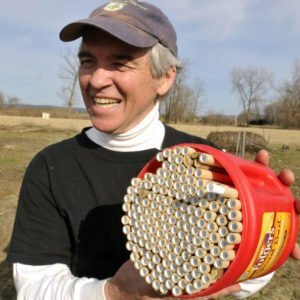 Through his company, Pollinators Welcome, Tom gives lectures on the nesting, forage, and life cycles of some of the 400 native bee species in New England, 70 percent of which are ground nesting. Others nest in hollow stems or pithy twigs of plants, such as staghorn sumac and elderberry. A beekeeper in his youth, Tom says he wanted to return to beekeeping and at Conway “made the link with the whole ecosystem,” expanding his interest from non-native honey bees to the broad field of native pollinators. Tom was named February 2013 “Green Hero of the Month” by the Greening Greenfield committee in Greenfield, Massachusetts.